I've been trying to find old photo's of me on my first motorbikes. I can't remember exactly how old I was when I got my first one, thanks bloody stupid MS memory. Then I found this old pic of me and my two brothers, with my mum's writing on it "Adam, Daniel and Greg, 1975". Blew me away. I was three back then. 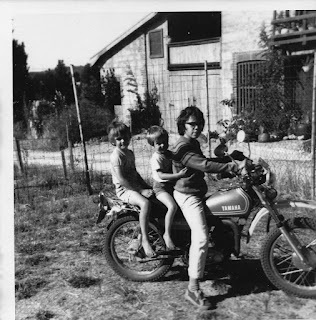 I can't be sure when I got my first motorbike, but I reckon it wasn't long after this shot, maybe a year or two that I got a PeeWee 80 and that was it. My ultimate dream would be one where I have enough money to leave everything behind on a world-tour that takes maybe 2 - 3 years, on a big fat Harley Trike. How old were you and can you remember your first bike? Leave me a comment belooooow.